Tags: DIY Home, DIY Projects, Home and Decor, Knock It Off! DIY Projects, Knock It Off! Want to add some inexpensive accessories to your space without blowing your budget? Learn how to create a unique side table out of an old trunk with this easy DIY project. One of Jess and Monica's favorite things is to repurpose unexpected items into stylish and functional pieces for a room. 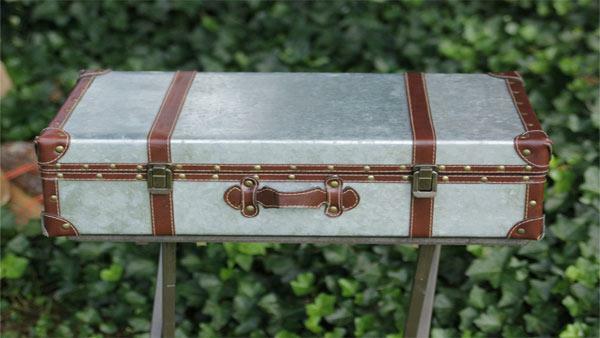 Here, an old suitcase or trunk from a thrift store and an unused TV tray table transform into a one-of-a-kind side table. Custom pieces like these don't come cheap when you buy them in a store, but here, we make this unique piece for less than $20. 1. Dismantle the TV tray by removing the old tray top. Be sure to keep all of the screws and pieces in a safe place - you'll be reusing them. 2. Spray paint the legs your desired color and let dry. 3. Using a circular saw, cut a new top for the tray out of MDF - medium density fiberboard - that is slightly smaller than your trunk. This will be the base the trunk will be screwed into. 4. Spray paint the base the same color as the legs. 5. Re-attach the legs to the new top, using the old top as a guide for your measurements. 6. Place the trunk squarely on top of the tray, open it and screw it directly into the table top in each corner.